When was the last time you washed your knitwear? I have to say it's one of the clothing maintenance things I'm worst at. Even though I know it's great to avoid pilling, and more importantly moths, I rarely do it. I feel guilty every few months and wash a few pieces, but it's not enough. Fortunately, the enthusiasm of Audie Charles in this film we made has put me back on the right track. I did three this weekend and it was just as calming as she said (both music and wine included). Audie also has some great tips on using a nail file for pilling, and is firm that stopping moths is all about prevention, not cure. Amen to that. Thank you to Audie, the whole of Anderson & Sheppard, and the Campaign for Wool for their help with this edition. You can follow the discussion on Video: How to care for wool knitwear by entering your email address in the box below. You will then receive an email every time a new comment is added. These will also contain a link to a page where you can stop the alerts, and remove all of your related data from the site. Audie is brilliant and we need to hear more from here . She looks like she knows enough to write a book to make all our lives better ! We might well do a follow-up – anything you’ve always wanted to know, do ask! Be great to hear any tips she can give . Be great to hear her perspective on classic men’s style and i get she’s got some juicy sartorial stories ! Anu tips she have for proper storage through the seasons would be great. And maybe some tried and tested spot cleaning of knitwear? – You can use a woollen detergent, a product like offered by “The Laundress” and place the garment (inside-out) on the gentle wool cycle. – You can put the garment (inside-out) inside one of the oversized cotton/canvas shoe dust bags and place some detergent inside of that or let it soak inside a machine or you choose to hand wash it. – Steam your garment with a handheld steamer when your wearing the garment now and again. And yes, you should/can wash it before your first wear to prevent pilling. But the best advice is buy merino wool knitwear – not alpaca, not cashmere, not lambswool. The latter is considered more luxurious because of their fibres – but they naturally have to pill. Thanks Mike, good advice and obviously some we cover in the video as well. I have found that when I am better at washing knitwear it’s much better at preventing moths than any other measures like cedar wood or sprays. Even just once a year makes a difference. I forgot as well. The woollen knitwear have natural oils bore from their animal. If you keep washing them too much, the garment will lose its elasticity (it’s natural “bounce”). Good timing – I haven’t washed my sweaters for ages. When I handwashed in the past, I found I needed countless rinses before it seemed like the soap had disappeared. Was I using too much, or am I too concerned with getting everything out? One of the best ways to remove the excess suds is to rinse the woolly once in the normal way squeeze out the excess water wrap in a towel and spin out the residue. Rinse again and follow your normal drying proceeded from that point. If it’s a fine sweater use a low revolution count to avoid creasing. I once considered trying to shrink a wool cardigan bought one size too large. After reading all kinds of advice I didn’t know what to believe and gave up. I think the theoretical question is: does wool shrink continuously in relation to rising water temperature or is there a point at which it shrinks uncontrollably? It’s not continuous, more exponential. There’s a point at which the fibres start to compress and felt where it starts to shrink very fast. The stages before that are hard to control accurately. I have tried! One of your most informative videos ever. It’s hard to find information of caring for knitwear. So well done. But you do have an irritating habit of asking a question and answering it yourself. Just let the expert speak. A demonstration of washing knitwear would have been nice, but I suppose it would require multiple takes and a lot more editing. Thanks for the input Bobby. Other readers have said they like both the questioning from me but also the clarifications and summarising. Often that’s not the expert’s strength. Following the review I purchased the Eucalan detergent (from Amazon UK but also apparently available from some specialists) and have gotten good results. As an aside, the Wirecutter website is a good source of reviews with its rigour and evidence-based approach. She has some great common-sense answers, as well as some that I find antithetical to the sweater’s longevity. There seems to be a middle-class obsession with “newness” that those of us brought up on traditional values find alien. So what if a sweater’s shape is different from when it first left the store? So what if it pills a little? Her solutions to these unimportant problems (e.g. dry cleaning, sanding down the sweater with emory board) cost the sweater’s longevity. Common sense is all that’s needed: wash, rinse, and air-dry; no hangers; snip off obvious pill-balls. And let the sweater age how it wants. If it is high quality, it will age pleasantly. This video was fantastic and extremely informative. Moths are the archenemy of knitwear and this video addressed this problem very well. Sound advice. Just to echo that hanging sweaters is the enemy. Make sure you request that dry cleaners pack away your sweater flat and not put it on a hangar. I’ve had very good results with Woolite delicate. Cashmerecareservice.co.uk is the solution for all woollens. I send my stuff once per year and they come back like new ! Would you use the same process (hand wash with gentle soap + lay out to dry) on cotton/cashmere blend shirts? I love the Smedley 85% cotton/15% cashmere polos but have only dry cleaned out of fear of the washer. Thinking the gentle method described here may be a better solution. Very informative thank you. With regards to storage I always fold heavier garments, however, the finer gauged items tend to crease too much. What hangers, if any, would you recommend for fine gauge knitwear? Other than something that has grip to help the sweater not fall off, there’s nothing specific I’d recommend. I’d still generally fold these though. It’s usually ok for me as long as it’s not in a big pile. Good work, very informative with a warm convivial tone and the conversation flowed well. Couple of requests if I may: please drop the coffee drinking clip at the head, with respect, it smacks of urban posing and is, ultimately, unnecessary for the brand or the content. Also, please lengthen the PS slate or logo at the tail – it’s not on screen long enough – 3 secs minimum – it’s your brand don’t skimp on showing it. As for the washing: great advice – though I machine wash everything from cashmere to merino. Low temperature on short cycle – slow spin. Best laundry detergent so far used is ecover delicate laundry liquid. Gently stretch to shape, dry and press. Fold. Audie shows how it is done but a small tip – an ideal, low cost folding board can be obtained by using a slim, unused chopping board; ideal size is 12×8” or 30x20cms but can vary (dictated, ultimately, by the storage dimensions of cupboard, drawer or shelf). Really stoked for part 2! Never felt the need to iron any of my knitwear, though. Great content as always Simon! It’s interesting to note that you – and indeed some of the people in the comments section – are so anxious about washing knitwear. My experience is that a modern washing machine on a knitwear cycle (low temp, low rpm, soft cycle, normal detergent) will work just fine. Indeed, what Audie describes in the video is a perfectly normal washing routine (with some extra elements such as using a pillow case/washing bag and drying flat). A lot of people seem to think that washing knitwear will wear it down, when NOT washing it might in fact be even worse. Dirt (which is often basic in nature) will actually harm and/or bleach fibres, so infrequent washing or overly careful washing techniques might have the opposite effect. Just soaking in cold water without any detergent won’t remove grime at all. Excuse me if I sound mansplaining, but I find it interesting that this is such a hot topic and that people are so anxious about their knitwear! No wonder manufacturers can charge 25 pounds for a small bottle of “knitwear balsam”. Regarding moths, is this a common issue in England? I’ve never even seen a moth among my clothes. I daresay it is highly uncommon in Sweden (don’t quote me on that). Clothes moths seem to be fairly international, but I’m sure it’s affected by climate. You’re blessed if you’ve never been affected by them! Fellow swede here, and I’ve also never come into contact with moths – however I know it’s been issues for older generations of my family. I believe they used to store a lot more stuff in the attic or the basement where moist and different temperatures would be an issue. In todays modern apartments at least, storage units, basements and attics (whenever they still exist) are all heated and have good isolation. Also people tend to store more stuff inside their apartments, which are again heated and isolated. I guess that’s why we’re lucky enough never to have encountered moths. Thanks Simon, the video is extremely helpful, and it is just wonderful to listen to Audie speaking. By the way, the two (suede?) jackets behind you and Audie in the video look nice. One of them looks like a refined version of the Valstarino, something I’d be interested in having. Did you get a chance to take a closer look at them? Thanks Simon. I just looked at A&S website. The one on the left seems to be what is called the “Fly Front Suede Jacket” in the online shop, and I don’t think the one on the right is online yet. The Fly Front Suede Jacket is selling at 1495 pounds, that is, more than twice the typical price of the Valstarino. Would you say that the suede and the make of that jacket is clearly superior to the Valstarino? I’d greatly appreciate your view, as I’m seriously considering buying that jacket. Very useful, thanks. I’ll attack my closet tomorrow. And Ms Charles is correct. It really is therapeutic. BTW, can I ask what your washing policy is for your best shirts? Hand, gentle machine wash? Do you ever get them dry cleaned? I have an Anna Matuozzo, and an Saman Amel, both very light cotton. Gentle machine wash, hang dry, never dry clean. Realizing I hadn’t washed most of my knitwear for ages, I washed it all this passed summer. – the heavier the knitwear, the bigger then pain of drying them. I have a chunky lambswool shawl cardigan – my understanding from the video is ideally I should get this dry cleaned – not hand wash as it is chunky – every half a dozen wears. Is that the case? It does seem like a lot of dry cleaning. Yes probably dry cleaned, but it doesn’t necessarily have to be that much. Given most don’t clean things like this at all at the moment, even just once a year is great. I tried to get my cat to do the kneading of my sweaters for me, but alas, it resulted in a row over moist paws. The cat asked me to watch the video again, and I realized Audie said I had to knead the fabric “like a cat” myself. In all seriousness, that is the most appropriate descriptor for an effective technique. As the saying goes: dogs have owners, cats have staff. Odd….I never assumed anyone would have ever washed a wool garment at the highest temperature anyway…I always thought it was using a dryer that did the majority of the shrinking/damage…. And Simon, I found the volume contrast between the interview (and Audie is very soft – spoken) and the music backing the written questions to be quite large…Perhaps a little more post – production detailing to sound editing might be in order….I found I had to keep re – adjusting the volume between the segments….otherwise good info…. Don’t ditch the “urban pose” with the espresso, Simon: you look magnificent in that suit, and appealing to the Beau Brummel in each of us is what part of PS is about. But, alas, working from home is getting to you; that sad brown cardigan (with pilling galore on the front) masking your lovely Luca Avitabile shirt (I’m enjoying the one I bought from you). “When to retire sad old knitwear?” was the one topic you missed from the video. That’s why I needed the tips Russ! One subtle detail about how Simon sips his espresso. Did any of us notice the he grabs it with the left hand and puts his lips on the wrong side of the cup’s edge? Many people do the same in Italy in order to minimize the risk of catching an infection in a restaurant or bar (clue: if one does it, chances are that he/she is healthy). Bravo! Simon, is this something that is commonly done also in GB? And is that an A&S Shetland that you are wearing in the video? 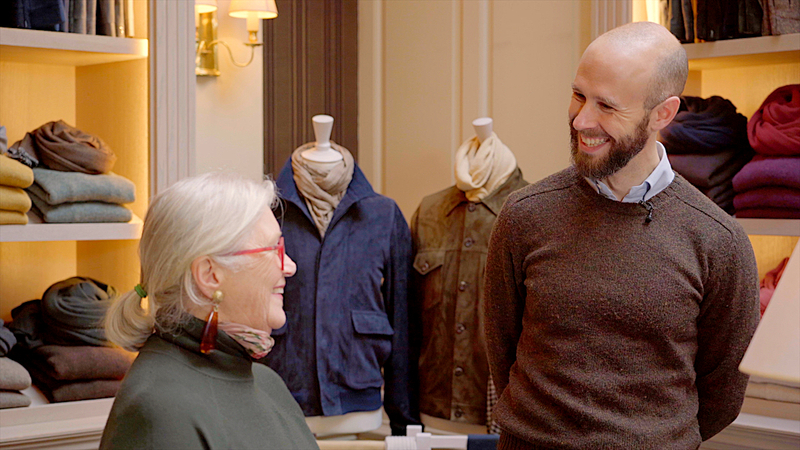 And… we want more videos featuring the very charming Audie: maybe selling ties, pocket squares, scarves. I hope she help me next time I’ll be in London. What a charming woman and a well-timed video. Hi Simon, thanks for this – Audie is a legend! Do you know the brand and grit number for her extra large emery board? I can’t find anything of similar size and I want to make sure I don’t get too much of a coarse grit. Thank you in advance. This post is an example of why permanent style is such a valuable resource. I’ve always believed you could never wash a wool sweater. Thank you for the information. What a delightful lady…. and fabulous information. Yeah, the coffee bit doesn’t add anything. I imagine people only drink like that if they know somebody is filming it, and in any event it actually looked like the cup was empty anyway. Audie is the person you want by your side every time you go on a shopping trip. A unique knowledge, and delightful personality. I imagine that even a trip to the dentist would be quite fun if she was with you. Hello Simon, a good feature. How about complementing the experts you consult on such things with interviews with materials scientists (or on other themes historians, anthropologists)? It would be very interesting to have multiple perspectives, outside of the industry, on care and style. It could open up other avenues for Permanent Style. The wonders of this blog – I never knew till now that Italians drank from the wrong side of the espresso cup – doesn’t say much for the person who washes them. Here in the UK we’re happy to risk drinking from the right side of the cup ‘cos we’re too busy hoping the coffee is good enough to have been made by an Italian. Congratulations on a wonderful informative video. I have a wool/silk/alpaca blend herringbone cap and it creates a terrible amount of pilling and ‘fuzz’. The emery board removes the pilling but creates more fuzz could you shed any light on this. It’s hard to know without seeing the material, but it might be lighter or looser in weave than the Merino and Shetland we are trying it on. Superb video and excellent advice. Is washing the most appropriate method for a 50:50 silk/cashmere turtleneck? I am currently agonising about how best to clean it and am (metaphorically) torn between the dry cleaners or washing it myself where I fear I will lack the requisite delicacy of touch to do so properly. Audie is wonderful to listen to. I was not fully sure of her accent – was she originally from Ireland? I must confess I did buy one of those “fancy machines with a razor” for about £15 or so as wool comb just didn’t work on a lambswool Ralph Lauren Sweater I wanted to remove heavy pilling from. I have say, it worked an absolute treat. I was a little concerned that it may damage the wool fibres but I needn’t have been. Would have been really nice if the footage actually showed Audie’s hands whilst demonstrating her cat paw moves as I felt the viewer missed something at that point, but still a great informative video! I have a little fuzz shaver as well. I have used an emery board as well but had read somewhere that they tear the fibres and actually increase pilling while the shaver (theoretically) cuts the fibre and leaves less of a frayed end to pill again. Have you ever heard any expert on whether one method is better Simon? It’s a little unfortunate that when she seems to be demonstrating motions with her hands and arms, the camera doesn’t move at all—she refers to what she’s doing but it’s impossible to see. Yes, I wondered about what her hands were doing too, but it was so pleasant to hear her voice it was like listening to a soothing lullaby, so I didn’t really care. Maybe I’m just a little tired as I watched this video but it was a real treat! She has great passion – a lovely person. Thanks Simon! Great video sharing information I’ve never run into before! Does anyone have an explanation for why washing will reduce the risk of pilling? I want Audie to advise me on everything in my life—great video.